AN ISLAND DIOCESE: SODOR AND MAN. BY THE REV. ALEX. A. BODDY, F.R.G.S., Vicar of All Saints', Monkwearmouth. THE Isle of Man in far away times was for some three or four hundred years a dependency of Scandinavia. We find many names, such as Snaefell, Sartfell, Langness, Ronaldsway, Spooyt Vane, Maughold, etc., whose form reminds us of this. Tradition tells us that the Viking Orry ran his galley ashore on the flat beach near the north of the island in the ninth century, and took possession. The Celtic inhabitants humbly met him near to where Jurby Church now stands, and asked him " Whence comest thou ? " Pointing up to the star-lit heavens, he said, " That is the way to my country." It may have been that their limited knowledge of each other's language may have caused a misapprehension of what King Orry really meant. Perhaps he was trying to tell them that he navigated with the help of the north star and that his own land lay far away northward. At all events, the Isle of Man was to these Scandinavians the southernmost of the Sodor or South Isles of Scotland  as compared with Shetland and Orkney, the Northern Isles. PEEL CASTLE, ST. PATRICK'S ISLAND. When a Cathedral was built for the Scandinavian Diocese of the South or Sodor Isles, it was erected on the Sacred Island of S. Patrick, near Peel. It was said that in his wanderings the Patron Saint of Ireland landed on the Peel Holme, and to his memory was erected the little church whose outline can there be traced within the castle walls. But now this island was also to be the seat (cathedra) of the Bishop of Sodor or the South Islands, and of Mann the chief of them all. So alongside Saint Patrick's Church, but with a different orientation, was built by Simon the Cathedral of S. Germanus or Germain. The Bishops of Sodor and Man were consecrated at the time by the Archbishop of Drontheim (then known as Nidaros), and they were responsible to him as their archbishop. This, then, accounts for the title of the present worthy Bishop (Dr. Straton), whose full legal title is "Bishop of the Isle of Man, of Sodor, of Sodor and Man, and of Sodor of Man." The Manx Historian (Mr. A. W. Moore, M.A., Speaker of the House of Keys) sums up the information as to the term " Sodor and Man " thus "The Scandinavian name of the diocese of the Kingdom of Man and the Isles was Sodor; this name Sodor seems to have been given to Peel Island as being the seat of the cathedral of the diocese, and at a later date, when it was forgotten that Man had been called Sodor, both titles were made use of to adorn the dignity of the modern bishopric." William Cashin, the ex-assistant Harbour Master of Peel, now the Custodian of the Castle and Cathedral ruins, spoke to the present writer of another possible explanation of the term " Sodor." He said that the Cathedral or the Island on which it stands, were at one time known by the Greek word " Soteer " or Saviour, which became corrupted into " Sodor." Within the castle walls, and just by the round tower near the site of S. Patrick's Church, King Edward VII. and his gracious consort, Queen Alexandra, took their mid-day meal on the tilting-ground, one afternoon in August last. It was a great day for the Island. One has to go back many, many centuries to find an English Monarch here. The Kings of Man were the Earls of Derby and then the Dukes of Athol. It was for long a semi-independent Kingdom, until in the last century all rights were ceded (sold) to the English Crown. Within these castle walls the writer preached inside the ruined cathedral a few weeks before the visit of the King and Queen. Up from the west came towering masses of threatening cloud, and the waterfloods above soon mingled their sounds with the roar of the waves below. It was a day not to be forgotten by those chiefly concerned. The next day, with the Vicar of S. Germain's, he [sic we] climbed along the cliffs to Glen Maye. The sea-fowl screamed and circled far below, and the sea stretched out in a vast plain to dome-shaped Sliev Donard among the Mountains of Mourne in the North of Ireland. It was a pleasant walk with times of interesting converse until we saw Niarbyl Point before us and the coast stretching to the Calf. We turned inland then to Glen Maye, and descending into its shaded wooded depths passed up the vale till we came to the waterfall in its frame of leafy glory just pierced by the bright sunlight. One evening we climbed Peel Hill, sometimes called Horse Hill. We looked down first on Peel Castle on S. Patrick Island, and then passed over the crest of the hill and looked down upon the town and up the coast. In the view we are looking exactly upon the scene. Northwards the coast stretches towards Kirk Michael and Bishopscourt. At Bishopscourt, the palace of the Diocese stands under trees planted by the great Bishop Wilson in the eighteenth century. At Kirk Michael is the grave of that revered man of GOD. Further inland Sartfell and other heights raise their rounded summits. We see in the picture the herring fleet at anchor, and the spire of the modern S. Germain's rears its head on the outskirts of the town. ACROSS the Isle of Man runs a vale, dividing the Isle fairly into Northern and Southern halves. At the western end of this bisecting valley is Peel, and at the eastern extremity stands Douglas. The road along this vale is undulatory, it is a pleasant road upon which to drive or cycle. There is also a railway line in these days along this vale. At a station called S. John's, passengers alight for Glen Helen and for the Tynwald Mount. The walk or drive up to Glen Helen is one of the sweetest sylvan excursions on the Island. The road is beside the rushing Rhenass River all the way. In summer-time it is always alive with carriages and chars-a-bancs laden with holidaymakers. A couple of miles up the valley is the entrance to the Glen Helen grounds, and visitors pay a small sum to view the waterfall. Further up the hills, after a stiff climb, is the little Church at Cronk-y-Voddy, where the writer ministered for awhile to simple Manx farm folk. The Manx, like other members of the Celtic race, are excitable, very religious, somewhat superstitious, and sometimes very sinful. The inflow of pleasure-seekers each summer is bad for the morals of the permanent inhabitants. They are best off who live farthest from the beaten track of the holiday folk from the big towns of what is sometimes humorously called " the adjacent island " of Great Britain. It is a shame that the beautiful Isle should be contaminated in some parts in the summer-time by caravans of card-playing, spirit-drinking carousers of both sexes. But high up on the hill-top is the little Church of Cronk-y-Voddy (the " Hill of the Hound "), and from its doors you look out on the Western Sea and over to Ireland. The scattered folk who make up the congregation. come from little white farmsteads a mile or so over the rolling hills, and some from Glen Helen and the banks of the Rhenass River. One day, when living on the Hill of the Hound, an invitation came to attend the meeting of the Island Legislature at the Tynwald Mount, when the laws were to be promulgated in Manx and English. The Manx Government, some fifty years ago, built the modern Church of St. John, near the Tynwald Mount. Once a year it is used by the Members of the House of Keys : first for public worship, and later on, when they return from the open-air promulgation of the laws, for the conduct of any non - contentious legislative business. A picturesque procession passes out from its western door at the close of Morning Prayer, and solemnly proceeds to the Mount. The Lieut.-Governor takes his place on the upmost step with his chief officials and the Lord Bishop. The "Keys," or members of the Manx Parliament, are below, and the parish clergy, in gowns and hoods, on the next terrace. Then the chief Deemster, or judge, conducts the business, and directs the reading of the laws. A summary of recent enactments is then read in Manx and in English. S. JOHN'S-TYNWALD MOUNT AND CHURCH. After the ceremony is over, and a military band has played " GOD save the King," the procession returns to the Church, and a short sitting of the Keys takes place. A Fair meantime is held in the open air beside the Mount. This is on July 5th (called, on the Island, S. John's Day). The Tynwald Mount is made of earth taken from each of the seventeen parishes into which the Isle of Man is divided. The name Tynwald is, like so many on the Island, of Scandinavian origin. It is said to be derived from "Thing" -a popular assembly-and " Vold "-a bank, or rampart, or field. When the Tynwald ceremony is ended, there is a rush of carriages of all kinds towards Douglas, etc., and streams of foot passengers also. One of our illustrations shows us the gentlemen's bathing creek at Port Skillion. We see it at high tide when the enclosing ramparts of the open-air swimming bath are submerged. At low tide the bath is left full of clear water, though the sea is some distance below. Port Skillion is really a portion of Douglas Head, and no one seems to know why it should be called a port. On Douglas Head, through the summer are held great open-air services, when the Bishop of Sodor and Man, and other preachers, address congregations of many thousands. In the Isle of Man the Gospel is often preached in the Apostolic fashion, vii., in the open air. Enormous congregations assemble Sunday by Sunday in the fine weather both here and in Kirk Braddan Churchyard. From time to time, also, in the Castle Yard at Peel, at one of which services the writer was invited to preach. The Benediction had been pronounced one Sunday afternoon on Douglas Head last autumn, and the crowd was dispersing, when a gentleman, through his binocular glass, looked southward over the calm, sunlit sea.
" Whatever are those two vessels steaming towards the Island so swiftly ? " he said to his friend. The vessels were then many miles away, but by six o'clock they were gliding into Douglas Bay. J One was a cruiser in His Majesty's Navy, and the other was the Royal Yacht, containing His Majesty King Edward VII. and his Royal Consort Queen Alexandra. They had come to pay a surprise visit to the Island. What tumultuous scenes of excitement! What surging waves of irrepressible loyalty swept over the Island of fair Ellen Vannin !
" A gentleman leaned out o' th' carriage and laughed at me, and they said it were th' King hissel'." Willie will live on that incident through the closing years of his life. " Th' King, he bowed to me, he bowed to ME!" Personal acknowledgment here is overwhelming when it is from the greatest and highest personage we can conceive of. What will it be when the King of kings personally acknowledges us individually before His FATHER and all the holy Angels" " Him will I confess." The very thought should light up the years of our life in anticipation of the great scene, when the King shall sit on the throne of His glory, and before Him shall be gathered all nations, when lie will in infinite condescension and infinite love recognize and welcome each one of us who has trusted Him, and has obeyed His Will. KIRK BRADDAN, with its stately new Church and its quaint old Kirk close to one another, is not far from Douglas. Its open-air services on Sunday mornings through the summer-time are attended by thousands. Though there is much that is sinful in the behaviour of some of the visitors to the Isle, there is also much sowing of the good seed. A lady writes to me from Ripon thus: " I was at the first service of the season at Kirk Braddan the other year. Whatever else has faded from my memory that scene still remains. The sermon I forget except the conclusion, which is as fresh as when spoken. The lovely trees in full leaf and waving in a strong breeze. Canon Moore standing on the stone, holding the Bible in his right hand (the graves of the dead and hundreds of the living all around him), he cried, 'Heaven and earth shall pass away, but the words of this Book will not pass away, but will live for ever.'" Castletown, in the southern part of the Island, was formerly the seat of Government. 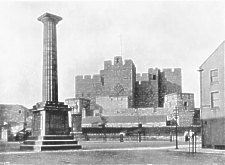 Castle Rushen, the Governor's home in bygone days, was also the prison for civil offenders, as Peel Castle for ecclesiastical prisoners. Bishop Wilson was imprisoned here by the Governor of his time, and stretched out his hands through the windows of his cell to bless the people. His was an unbending nature-an iron will when convinced that he was in the right. He believed in such a rigid enforcement of Church discipline as would cause us to gasp for breath in these days. A woman of evil life, but also, it is said, of somewhat weak intellect, he caused to be towed across the harbour at Peel behind a fishing-boat, as a punishment and a warning to like offenders. Other sinners were condemned to appear in three Churches in turn on three consecutive Sundays, and clad in the white sheet of a penitent to recite the fifty-first Psalm before the congregation. He invented a bit and bridle for women who spake evil of others, and he excommunicated the Governor's wife for slanderous conversation. With such measure meted out to others, some of us are scarcely astonished when we read of the Governor in turn treating him with equal severity, such as nearly cost the Bishop and his Vicar-General their lives. But while in Castle Rushen they planned the translation of the entire Scriptures into Manx Gaelic, and this was accomplished in the episcopate of his successor. RUSHEN CASTLE, FROM THE MARKET PLACE. Beyond Castletown we come at last to the southern extremity of this Island Diocese. Cregneash Church is in the southernmost parish, and in that peninsula known as "The Howe." The people here mostly speak "the Manks." Then we see the " Sound," with its swift current, and the lonesome Calf of Man beyond. Some ships of the ill-fated Spanish Armada, which strewed our western coasts in 1588, are said to have been wrecked here also. I crossed the Sound last summer, and was interested in the swarms of rabbits, great and small, on the Calf Island. The former and the Lloyds signalman have a lonely time of it on the Calf. Their parish Church is Cregneash, and I am afraid the children but rarely get to school or Church. Port Erin is a sheltered cove built round with modern houses, and overshadowed by Bradda Head on the north side. Here yachts and fishing boats lie at anchor or sail away to the west. Up the coast we see the heights of Cronk-nyIrey-Lhaa-the hill of the setting sun-looking out on to the western sea. The sun casts a pathway of glory across the swell, and goes down at last leaving a burnished *track athwart the sea, and shafts of glory strike through the cloudlets. CALF OF MAN AND KITTERLAND. The herring fleet is slowly passing to the southwest and preparing for the work of the night. Soon the lights twinkle out, as the lamps of the fishing fleet are lit, and another day on the Island is ended. Send us Thy help-remember Galilee. By night, the silver harvest of the sea." PORT ERIN HARBOUR AND TOWN. THE Vicar of Foxdale ministers to the largest mining population on the Island. These silver lead mines are said to be among the richest in the British Islands. His Scripture Union summer gathering last year was an incident to be long remembered by the writer. The "Captain of the Mine " (Managing Engineer or Director) is a good friend, and the Company help his stipend. The Manx clergy need, indeed, to have private means, or to have wonderful gifts of skilful finance. They are sorely tried by the scantiness of their endowments. The other lead mines at Laxey are better known because of the great water-wheel, 72 ft. 6 ins. in diameter. It was erected as far back as 1854 for the purpose of pumping the water out of the mines close by. It is said to lift from the depth of 300 fathoms 250 gallons per minute. Water raised by water! The power is simply a stream brought down the mountain side in pipes and then up the circular white pillar and discharged on the top of the wheel. In summer time Laxey is often like a fair owing to the thousands of visitors who have come for day excursions by steamer to Douglas, chiefly Lancashire folk, but also Scots frae Glasga', and Irish lads and lasses from Belfast. 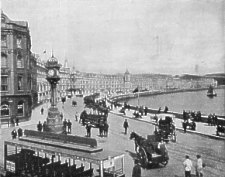 Arriving at Douglas, they take the electric car to Laxey and visit the "Lady Isabella," as the great wheel is called. The Isle of Man Steam Packet Company has a splendid fleet of swift steamers. The Empress Queen makes the passage from Liverpool in little over three hours. When the writer was a boy five hours was an unusually good crossing. 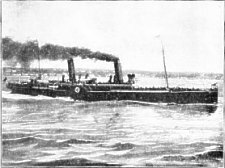 The first steam packet was the Mona's Isle, 108 ft. long and of ninety horse power. Captain William Gill was placed in command. He had been in charge of the sailing vessel, The Duchess of Atholl, which had up to that time carried the mails between Liverpool and Douglas. From the Island have gone forth to all parts of the world sea worthies, who have brought honour to the Island. In his early service he was appointed by Admiral Lord Duncan to act as Lieutenant at the Battle of Camperdown; after the Victory was achieved, this appointment was confirmed. His gallantry and professional skill at the Battle of Camperdown attracted the notice of Lord Nelson, who subsequently sought for his services on board his own ship, and as his lordship's first lieut. he steered the Victory into action at the Battle of Trafalgar. By the example of Duncan and Nelson he learned to conquer. By his own merit he rose to command : above all this he was an honest man, the noblest work of GOD. After many years of honourable and distinguished professional service, he retired to this land of his affectionate solicitude and birth, where in his public station as a member of the House of Keys, and in private life he was in arduous times the uncompromising defender of the rights and privileges of his countrymen, and the zealous and able supporter of every measure tending to promote the welfare and the best interests of his country. He departed this life on the 10th October, 1829, in the 59th year of his age. This monument is erected by Margaret C. Quilliam to the memory of her beloved husband." Thus we see that a Manxman had a good deal to do with winning the great battle of Trafalgar, for a shot from the Bucentaur having shot away the wheel, Lieut. Quilliam caused the damage done to be repaired according to a plan of his own; and then, not feeling quite sure how this would act, he took the tiller into his own hands. Joseph Skillicorn was a sturdy salt, whose body lies in Kirk Braddan. The Rev. T. E. Brown wrote of him: " I remember sailing with him one day from Ramsey to Douglas. The captain was sitting on an inverted bucket, cutting some tobacco. We were passing under Kirk Onchan. Do you know the quld name?' he said. 'Yes,' I said, ' Kionedroghad.' 'Do you remember Parson Craine ? ' ' Of course I do,' said I ; ' he was my godfather.' ' Well,' said the Captain, ' that's the first man that ever hove the water in my face! ' " This was the strange way in which this old salt referred to his baptism. In a book entitled " Manx Worthies," compiled by A. W. Moore, M.A., we have many strange anecdotes of Manxmen of the port. And scored with runes or human joy and pain. Break into song ; let him that hath such love have praise ! " The people who speak the Manx Gaelic are a diminishing number, but they treasure their Bible in the Manx language. Bishop Wilson, when imprisoned for nine weeks in Castle Rushen by the Governor of his day, was accompanied by his two Vicar-Generals, Curghey and Walker. They employed their time in translating the four Gospels, the Acts, and part of the Prayer Book. But Bishop Hildesley completed the work with the help of his Manx-speaking clergy, among whom he divided the books of the Bible. Then they were revised, and the manuscript taken to England to be printed. The Rev. J. Kelly tells how when sailing to Whitehaven with a portion of the Bible (Deuteronomy to job) they were shipwrecked, and for five hours held the precious manuscript above the water, and it was the only thing saved. This was in 1771. When John Wesley visited the Island he wrote in his diary under the date of June and, 1777, " A more loving, simple-hearted people than this I never saw. And no wonder for they have but six Papists, and no Dissenters, in the Island. It is supposed to contain near thirty thousand people, remarkably courteous and humane." That ever was, was ould Pazon Gale. A line, and the keen he was and the spry ! But tremblin'-aw, but we liked him, though. There are good men in the Island now from the Bishop downwards, and good men are needed sorely there, as in all other holiday resorts, to be the salt to give the good savour. The reader of these articles who would like to know more of the Island Diocese is recommended to obtain from the S.P.C.K. " Sodor and Man," in its set of Diocesan Histories, and " Manx Worthies " (S. K. Broadbent & Co., Victoria Street, Douglas). An illustrated guide to the Island, with map, etc., will be sent free to anyone writing to the Secretary, Official Board of Advertising, Douglas, Isle of Man.
" EMPRESS QUEEN" LEAVING DOUGLAS.